It has been nearly 48 years since an Arnulfista president was ousted in a coup d’etat. But will President Juan Carlos Varela’s tone-deaf response to foreign pressures, failure to carry out campaign promises and protection of criminal elements among his cabinet, party and government contractors combine with an economic slowdown to cut short his term? And even if things don’t get that extreme, will posing with law enforcement officers convince the world that he’s not shielding crooks? Photo by the Presidencia. In light of the US sanctions against some 70 businesses controlled by the Waked family — which along with the Motta family controls the duty free areas at Tocumen Airport — CitiValores, a bond trading division of the US-based but largely Saudi-owned Citi group of companies, has pulled out of its offer to buy $625 million in bonds to finance the national airport’s expansion. In a May 10 letter sent to LatinClear and Panama’s Bolsa de Valores, CitiValores claimed that unspecified conditions had not been satisfied, so the bond purchase was called off. Certainly a US ban on any American citizen, resident or entity doing business with the Wakeds’ duty-free shops affects the potential value of an expanded airport. Long ago the American Embassy fingered the Motta family as well as the Waked family as Tocumen Airport money laundering suspects. US action against the Mottas should not entirely be ruled out. In recent days the Motta-dominated Manzanillo International terminal was eliminated as a potential bidder for the Panama Canal Authority’s projected Corozal / Diablo port project. Also, the largely Motta-funded Independent Movement (MOVIN) that played a major role in getting Juan Carlos Varela elected as president has expressed its annoyance with “public contracting reform” legislation that bans companies convicted of bribery in Panama (of which there are none) from doing business with government agencies here, while permitting companies convicted of such abroad (Odebrecht, plus more than a dozen other companies with Panamanian public contracts at various stages of confronting corruption charges in foreign courts) to continue as before. (Varela may yet back down on the pro-Odebrecht stand.) Whether Motta setbacks and disappointments have any causal connection with the global uproar over the Panama Papers and US moves against the Wakeds — either way — the cloud of suspicion can only hurt Tocumen SA as a business. For the Mottas the duty free concession is a minor factor compared to their ownership of a controlling interest in Copa Airlines, which uses Tocumen as its international hub. These problems come to Varela and Panama as OECD and European Union pressures that have been on again and off again are raised because the Panama Papers revelations indicate that the “know your client” reforms and pledges to get dirty money out of Panama’s financial systems exist on a continuum that runs from ineffective to insincere. The Fonseca family’s continuing sinecures in Varela’s administration and party do not help appearances. Also forming the backdrop to the unfolding crisis is a miserable Latin American economy that hurts business for the import/export sector, the Panama Canal and Panama City’s financial institutions. The downturn is mainly due to a weak economy in China, which had been buying more raw materials at higher prices from Latin American countries before problems set in. That governments of most stripes are in trouble across the region is in turn largely a function of this economic slowdown. Have businesses large and small in the Wakeds’ and Mottas’ original stronghold, the Colon Free Zone, been dabbling in money laundering schemes that they had been avoiding just to survive through a time of plummeting sales? Does the United States move now to control a situation that Washington has known about for years because the problem is getting worse? We are left to speculate about many things. 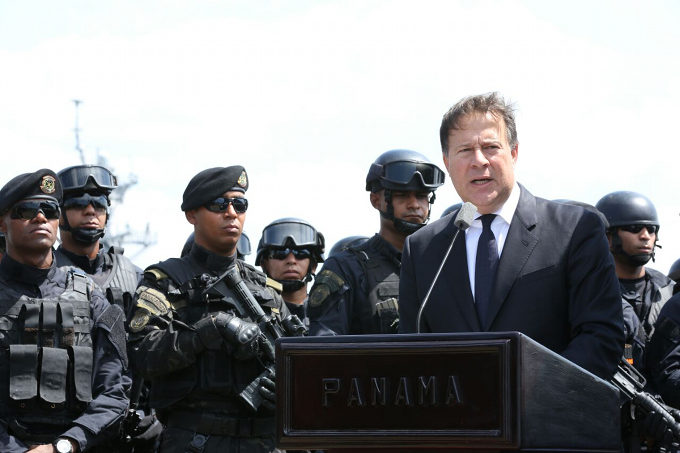 The stone-faced reception that President Varela got during his recent trip to Washington does not bode well for Panama. The pledge that Panama will start to share tax information in 2018 seems not to impress. The notion that this will all blow over and everything will go back to the way it was before may be a traditional outlook, but the way things are going it appears to be more conventional than wisdom.